On this page we are going to have a look at the extremely versatile Landroid M from Worx. We will run through the features of this brilliant robot lawnmower and help you decide if it is the model for you. We all have very specific requirements when it comes to looking after our lawn so make sure you look out for the features that are important to you. The quality of the cut is very important and you will be impressed by what the Landroid can do. The length of the lawn can be altered between 20mm and 60mm and the grass is cut by a three pivoting blade rotary disk that will cut the lawn very nicely leaving you grass in good condition and will mulch the cutting into fine dust to lay on the lawn for absolute tidiness. Mulching is also a great way to feed your lawn as well, an added bonus! The lawn height adjustment is with one simple control on top of the mower where as some models needs a tool to be inserted underneath which can be a bit of a pain. Using GPS and the perimeter wire the mower will make sure that it has cut every blade of grass for a brilliant looking lawn very single day. The features are very impressive on this model and really offer a lot for the money, other brands are sometimes double the cost for same sort of performance. Have a read through and see if this really could solve you lawn management issues. The big difference in a lot of models is the capacity it has when it comes to the size of lawn it can cut and look after. The range is very important as you need a powerful enough robot lawnmower to cut the lawn again and again year after year! The Landroid M WG790E has a very large range for an entry level model, cutting lawns up to 800 meters square. This means that any lawn from a square patch in a new build garden to a fairly large lawn attached to a big house will be fine for this model. To put it into context 800 metres square is 0.2 acres and that is a big lawn for most of us. The Worx Landroid M can cope with some pretty steep slopes and banks in the garden of up to 35 percent gradient. This is a steep gradient and is more of a bank so if your lawn is on a gentle slope it will be fine. But always remember to measure your lawn size and the steepness of any slopes you are not sure about. Sensors in the mower can tell when the terrain is steep and will make sure that the Landroid doesn’t fly off down the hill. It will give you a great cut up and down the slope as well as on the flat bits of the lawn. This is a great feature that not all robotic lawnmowers have, the Landroid will sense when the lawn is wet and stop cutting then will return to cutting once the rain has stopped. This will add to keeping your lawn in very good condition. In the UK it is a very important feature as the weather can be unpredictable and you may have small dry windows of dry weather to keep the lawn cut. A question we get asked a lot about robot lawn mowers is if they get stolen. The answer is no because the Lamdroid M has a PIN code system which means you need the PIN to operate the mower. There is also an alarm that goes off if it is lifted off the base plate. The mowers are paired with the base station as well which means the mower on its own is no use. This is a good anti theft system. The power unit that drives this robot mower is a 28 volt brush less electric motor that gives off no commissions when it is running unlike the petrol mowers that are very bad for the environment. The Lithium ion battery takes around 1.5 hours to charge and the mower runs for about 1 hour at a time. Once the battery is running low the Worx Landroid will take itself back to the charge station by following the perimeter wire and charge itself up before carrying on with the job. The Landroid M uses sensors to detect the perimeter wire to know the area to mow. It’s very simple to set up, the wire is buried just below the surface of the lawn and stops the mower venturing into areas it shouldn’t. Any areas like borders, trees or rocks you want to avoid you can just run the the wire around them keeping the robot mower away. This is a pretty standard way of setting up a robot mower and is simple and effective, it says that this can be done in an hour but it will depend on the size of your garden and how complex the perimeter area is. If you have a straight froward square patch of lawn then it will be easy but if it has lots of obstacles and bits to go around it could take a bit longer. Once you have mapped out the lawn you just let the mower go. Safety is very important when it comes to having an automatic cutting device roaming around your garden especially if you have children or pets. The Landroid M WG790E has plenty of safety features to stop any potential mishaps. The bump sensors will stop it if it touches anything in front of it and will reverse out of the way instead of moving forwards. The blades have an automatic cut out that are controlled by a tilt and lift sensor. If someone picks the unit up or it tilts over too far and may fall the blade cuts out. The cut out time is under two seconds which is very quick! You can be quite relaxed when the Landroid is moving around your lawn knowing that if anyone picks it up it will stop immediately. Spares and repairs are easy to manage with the Landroid. Worx have a direct UK customer service numbers if you have any issues and spare parts are available from them or from other retailers of the products. The great thing about robot lawn mowers is that there is not a great deal to go wrong. The battery may need replacing every few years and the blades should be replaced every year but that is it. A big advantage over the petrol lawn mower is that the robotic mowers are far more simple when it comes to moving parts that can break. The box arrives with every thing you need to get up and running straight away. There is the mower, charge station and blades. The wire, pegs and tools to get the perimeter mapped out are also in the box ready to go and there are even a couple of sets of spare blades which is very handy. It really is a full kit and in the unusual event that you need more perimeter wire it is readily available online. We have to say that this is a brilliant robotic lawn mower. It offers a large range which means it will suit many gardens of various sizes. The features are exactly what you need, there are models on the market with more gadgets but most people won’t ever use them. This does the basics brilliantly and will keep your lawn in tip top condition all year round with no fuss. Value for money is brilliant at under one thousand pounds and together with a two year warranty should give you plenty of peace of mind that is is great mower. This is a market leader at this level of mower for the average size lawns and gardens. A very popular model with many very happy customers. 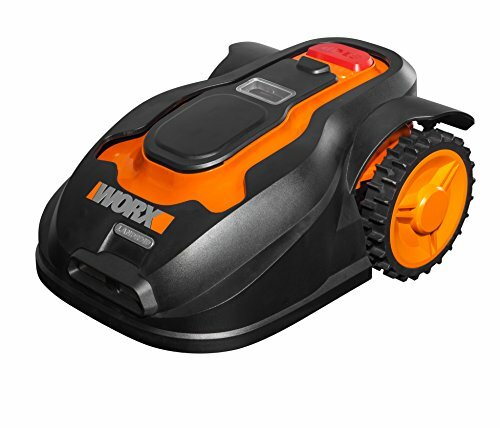 We highly recommend the Worx Landroid M WG790E Robotic lawn mower.